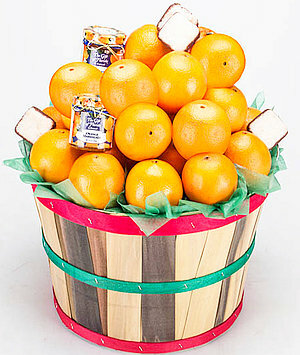 Packed with seasonal Florida Oranges or a mix of Oranges and Ruby Red Grapefruit. About 20 pounds in all. Special Florida goodies include a 5 oz. jar of Orange Marmalade, 5 oz. of genuine Honeybell Marmalade, 8 oz. of pure Orange Blossom Honey and a half-pound box of creamy chocolate-dipped Coconut Patties.